Vice-President of Vietnam visits RTU campus. 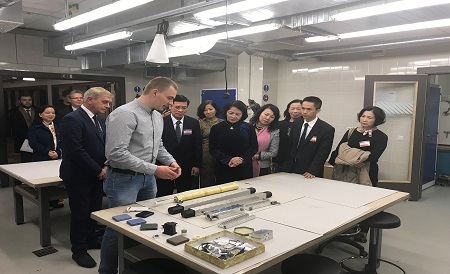 On 20 October the Vice President of Vietnam Dang Thi Ngoc Thinh and representatives of various ministries in Vietnam visited RTU Campus while being on the official visit in Latvia. During the meeting Deputy Rector of International Academic Cooperation and Studies Professor Igors Tipans presented study programs and opportunities offered by RTU to foreign students, while Professor Gatis Bazbauers, Vice-Rector of Science informed about the areas of scientific research at RTU. At the end of the visit, the Vice-President and the accompanying delegation visited the Faculty of Architecture and the Design Factory. http://wpweb-prod.rtu.lv/fsd/wp-content/uploads/sites/65/2017/10/Vjetnamas-vizite.jpg 274 450 sigitasaicane http://wpweb-prod.rtu.lv/fsd/wp-content/uploads/sites/65/2016/10/RTU_horizont_LOGO_eng_PNGsaveForWeb82_t-1.png sigitasaicane2017-10-25 14:23:102018-11-01 13:11:36Vice-President of Vietnam visits RTU campus.